Week 1 of Fiesta Fridays First Annual party was a huge rocking success. There were many new enthusiastic guests who popped in besides the fiesta regulars.Every one was received with equal warmth by the gracious hosts . No wonder why people rush to The Novice Gardeners’ in flocks and droves. Congratulations to the awesome host Angie @ The Novice Gardener and her super duper co-hosts Hilda @Along The Grapevine and Julianna @Foodie On Board for successfully completing the first course of the fiesta. Week 2 happens to be the ‘Dessert and Main Course’ round. This week’s fiesta will be co-hosted by my very dear friends Nancy @Feasting With Friends and Selma @Selma’s Table who are all going to make sure that you have a rollicking time at the party. While I am busy with the fiesta, my kids are already excited about the Super bowl. And that means making lots of goodies and munchies for the weekend. but right now I am making Chinese basket Noodles with seasonal veggies and chicken. The vegetarians can leave the chicken and still make the dish. It tastes just as good. Since the baskets can get soggy, I am carrying them separately and spoon in the vegetables only when I am about to serve. 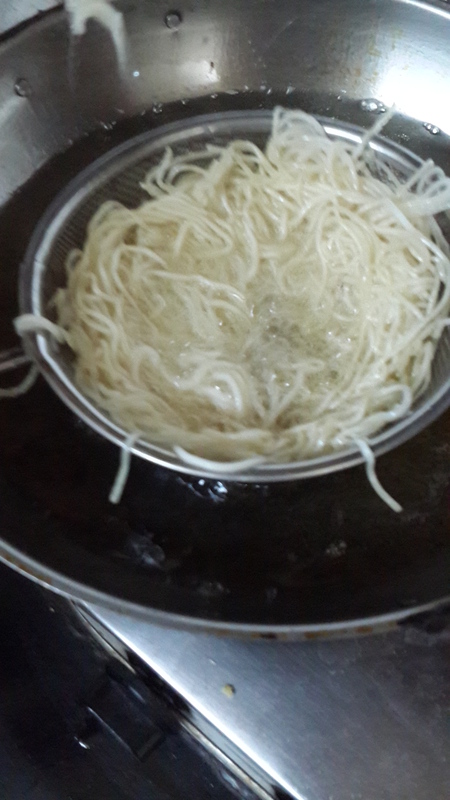 Boil the noodles in a big pot of salted water till al dente. Drain and rinse with cold water to stop further cooking. Add a tablespoon oil and toss so that the noodles don’t stick. Now spread them on a clean kitchen towel. Heat oil in a wok. 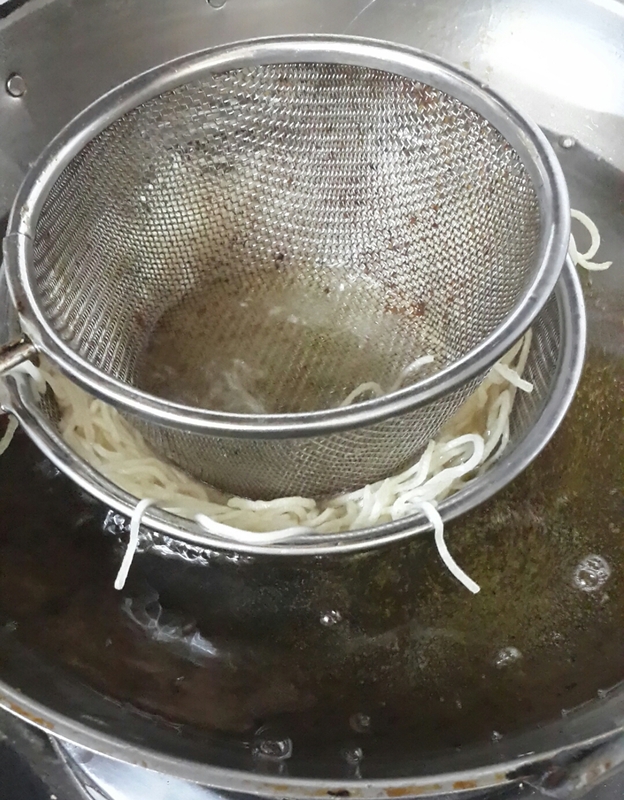 Place a portion of the noodles in a sieve/strainer to make a basket, along the mesh of the sieve.Place another sieve on top to hold the noodles in place. Put in hot oil and deep fry till golden brown in color. Remove from the sieve and keep aside on a paper towel. Basket is ready for use. Mix all and deep fry. Keep separately. Heat chilli oil in a wok ( I didn’t have chilli oil. So, I just sauteed a couple of red chillies in the oil and left them in the oil for two hours. then discarded the chillies and used the oil). 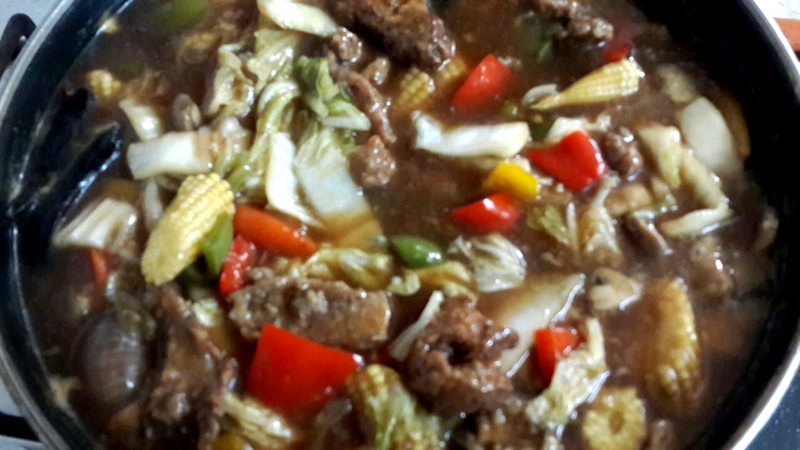 Saute red chillies,onion,ginger garlic paste, carrots, mushrooms, baby corn and peppers. Add salt, sugar, soy sauce and stock. Add the thickly chopped bok choy. 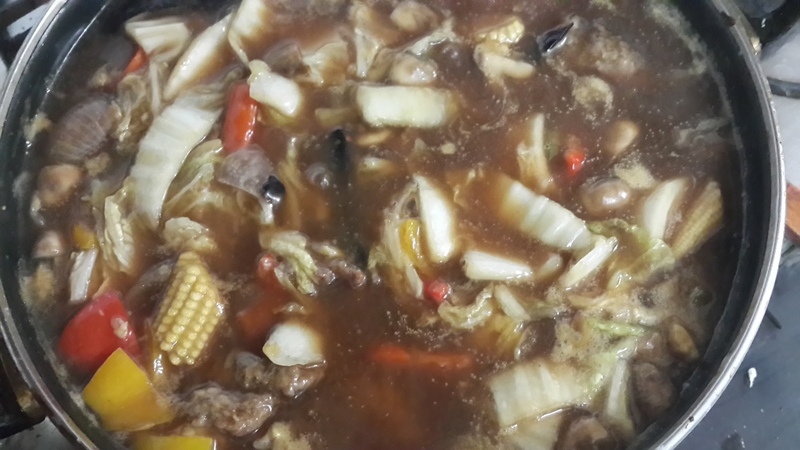 Add the cornstarch and simmer for a couple of minutes.Add some more stock or water if needed. Don’t overcook.The vegetables have to be crispy. 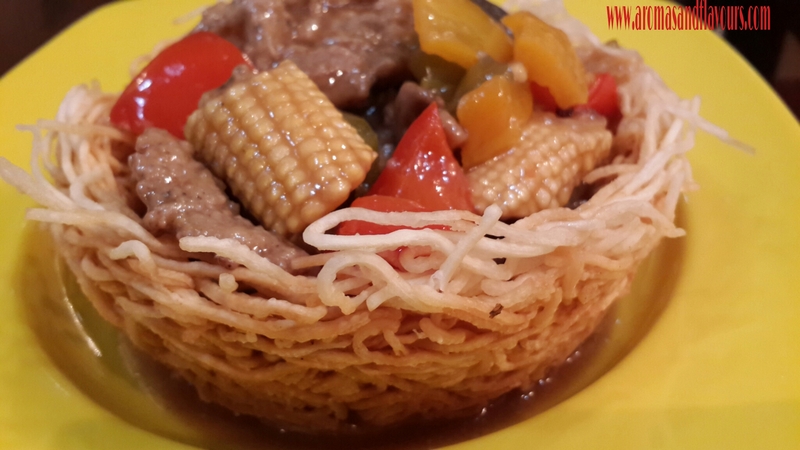 Serve hot on the noodle basket. Remember to put the vegetables in the basket just before you serve. Otherwise the basket may turn soggy. Top with chicken tenders to those who want a chicken version. I love the idea of the noodle basket! 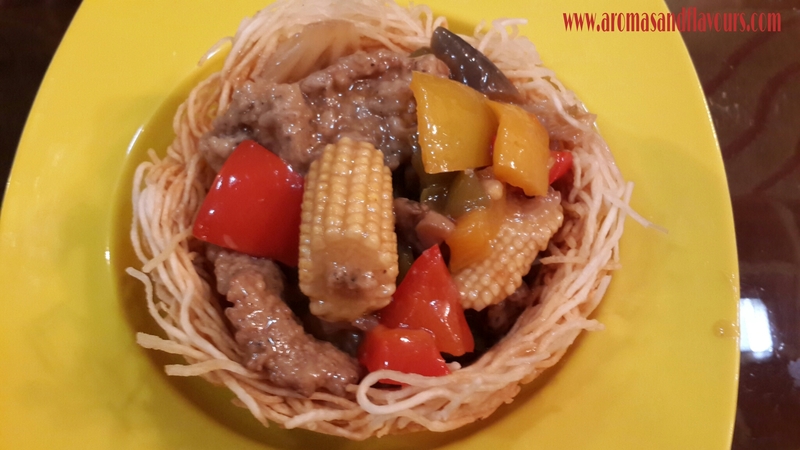 These look delicious, I love that noodle basket! Thank you Michelle ☺It’s not difficult to make at all. Thank you for your kind words Nancy ☺You are an awesome host.Love the FF even more when you’re co hosting it. This looks beautiful and very tasty! I wish I was watching Superbowl at your house:) love the noodle baskets! The pictures are so amazing that I feel if I reach in I can grab one of those yummy baskets! Aww… I wish so too Sandhya ☺What fun it would be. And I wish there was a way to beam food over the Internet. We could exchange our dishes. Yummmmy…. Oh that would be so much fun! I would have my list ready for beaming food over from your amazing blog! wow! What a beautiful meal. Looks terrific. How creative, I’ll bet these were a great hit at the Fiesta and will be for Superbowl Sunday today. 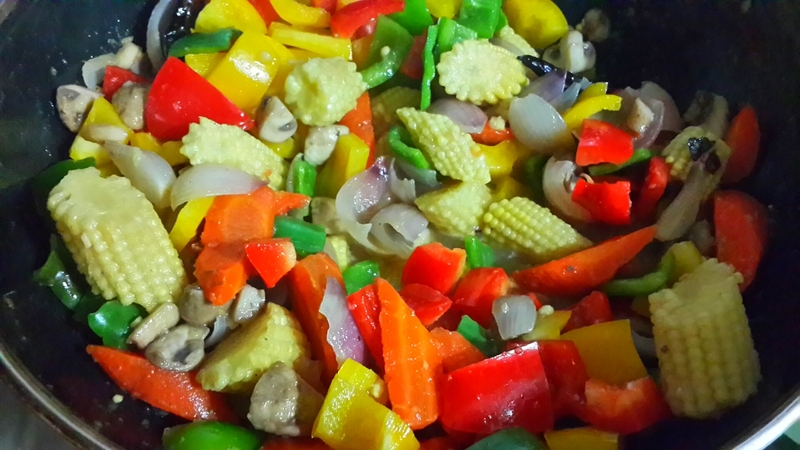 The ingredients and the flavored veggies look so bright and colorful. Great job! Thank you Loretta ☺It was just as fun making it. Wow! 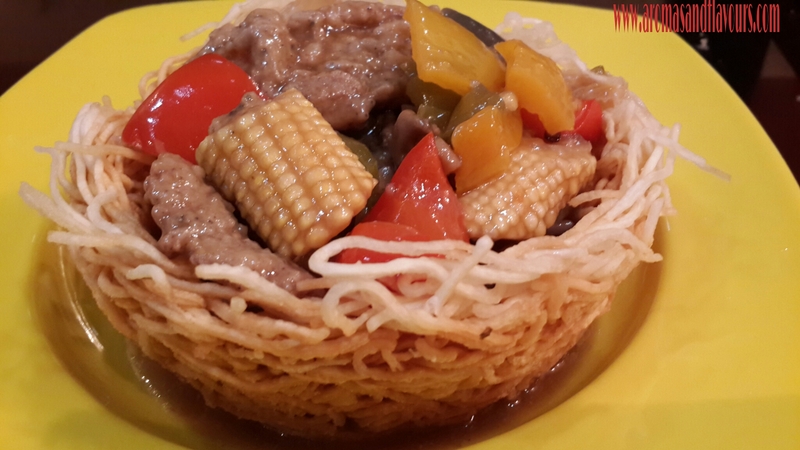 What a beautiful noodle basket – crunchy and yummy. 😀 Happy FF. How cool is this? 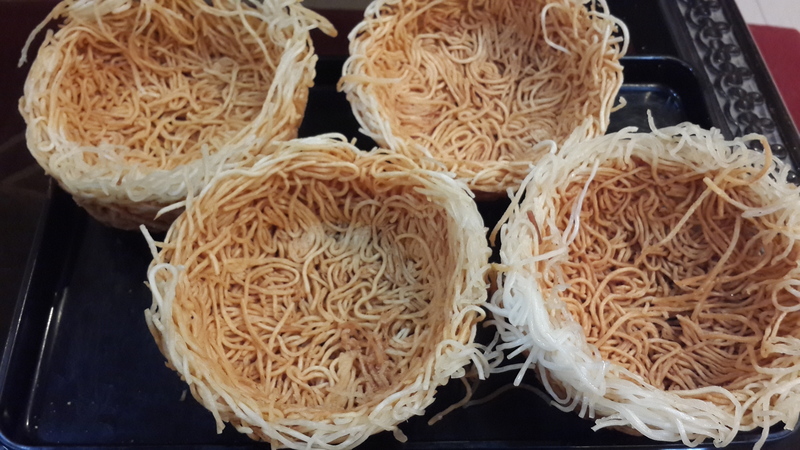 I haven’t seen basket noodles before but this looks so fun! The process of making it is exciting too. And we can prepare the baskets and store them in an air tight container till use. Those baskets look like so much fun. Thanks for sharing. I love this idea, so neat!! 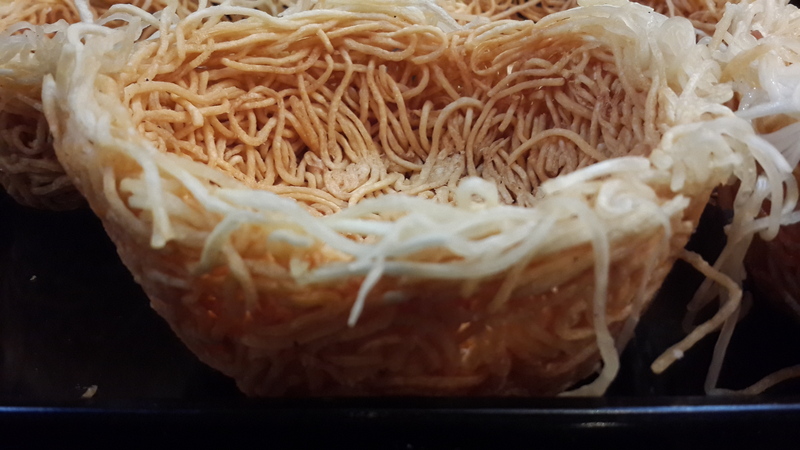 Thank you Petra ☺It is a small twist on the crispy noodles traditionally served.